Add water to buckwheat and heat on high 1 1/2 -2 minutes in microwave. Add stevia and cinnamon and mix well. 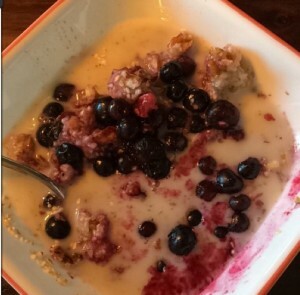 top with blueberries and walnuts. Add Almond milk to your liking. Enjoy your Real Food breakfast! Today I wanted to make some hummus, but I noticed I still had an avocado to eat that was ripe. 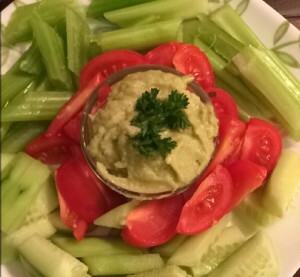 Â I decided to come up with a hummus recipe using both cannellini beans and avocado. 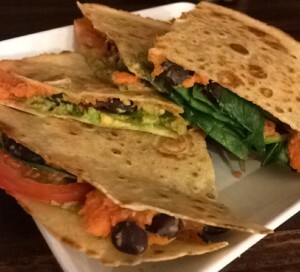 Â The combination of avocado, mild beans, and green chilies made a very satisfying and filling snack! Give it a try, it is simple and easy to make and will give you a healthy real food snack packed with protein, fiber, and healthy fats along with vitamins and minerals from the veggies you eat with it! Â Please comment Â below and tell me what you think! I made this recipe the other night for dinner as I was craving a spicy asian dish with coconut milk and peanut sauce. Â I found some Red Rice Noodles that come in very small serving sizes, which is perfect when you are watching your carbohydrates coming from grains. Â It was super simple to whip up and was ready in about 30 minute from start to the first bite. Â I simply chopped up the vegetables I had on hand, which happened to be zucchini, Â carrots, mushrooms, green onions, and parsley. Â I added some coconut milk, peanut butter, garlic, red pepper flakes, and Braggs liquid aminos. Â After cooking the noodles, I added them Â to the veggies and it was simply perfect, in fact, there were no leftovers of this one! Try the recipe below! Directions: Start water to boil noodles. Â While you wait, chop up the vegetables and add to a preheated skillet on medium high with coconut oil. Â add zucchinis first, then chop the mushrooms and add them, then add the remaining vegetables and garlic, saute vegetables until tender and put on low. Add coconut milk, peanut butter, and red pepper flakes until its blended through vegetables. While you are cooking the vegetables add the noodles to boiling water and set timer. Â after the noodles are done and you have mixed the coconut milk and peanut butter mixture to pan, add the cooked and strained noodles and mix well. I had to cut some of the noodles while in the pan to make it mix together better. Add Braggs liquid aminos to your preference after serving. Â Enjoy! I was craving something healthy and Mexican food. 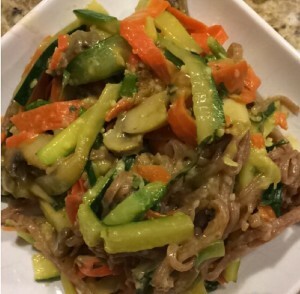 The recipe is vegan and gluten free which is great for those with food sensitivities. The problem, with not using cheese, is its ability to hold all the yummy goodness together! I came up with a way to hold the goodness of several healthy vegetables together and it tastes absolutely delicious! I used two whole gluten free tortillas for each quesadilla. Since I was in a hurry, I grabbed some frozen, cubed sweet potatoes and this was ready in no time at all! I steamed some Swiss Chard to go along with it and it was a super duper satisfying meal! Here is the recipe! Lets put it all together! Remove the second tortilla from pan and put the other one back in pan with uncooked side down, and add smashed avocado to the cooked side of second tortilla. Place on top of sweet potato and tomato and spinach and cook until browned. Carefully flip in pan and cook other side until browned. Slide out of pan onto cutting board, cut into 4 pieces and serve with salsa of choice, if desired.